At Moorooka Suzuki, we know that our customers appreciate great cars at great prices. That’s why we regularly offer fantastic specials across our range of New Suzuki Vehicles. 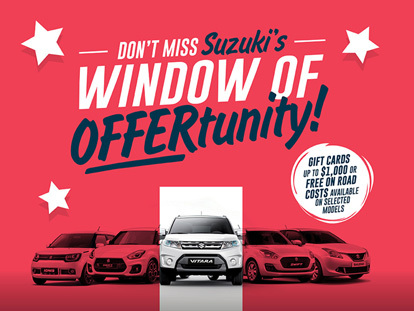 When you visit our Suzuki dealership in Moorooka, you’ll be able to take advantage of the latest Suzuki deals. At participating QLD and Northern Rivers NSW Dealers. Free ‘On Road Costs’ include 12 months’ registration, stamp duty, and compulsory third-party insurance – available on selected CVT/AUTO models only: Swift GL Navi, Swift GL Navi + and Grand Vitara 5 Door 2WD. Coles/Myer Gift Cards available on selected AUTO models only: Vitara GL and GLX 2WD Turbo $1,000, Swift GLX $500, Baleno GL $500, Ignis GLX $500. Gift card redeemable as saving off the Drive Away price on selected 2018 plated vehicles. Auto / CVT as applicable and Metallic and 2-Tone paint extra. All retail offers are whilst stocks last. With FREE On Road Costs.